Frosted Window Film can be applied to the entire glass for privacy or can be used in a computerized-cut graphic to produce lettering, logos and other creative design applications. Frosted Films are one of the most widely used and versatile window films available. These films are opaque-to-translucent yet permit natural light to pass through. Frosted Film can be computer-cut into almost any design. 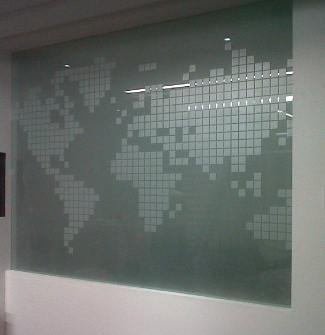 It is the perfect material for privacy, glass decoration, corporate branding and manifestation to windows and to glass partitions. Our in-house Graphics Department allows us to produce design options and artwork proofs prior to the installation of your glass decoration. All our computer-cut graphics are produced using the latest software and equipment. This ensures quality control, keeps you close to the project, and results in unsurpassed turnaround.